Your Visit To The Neurosurgeon - Diana Kraemer M.D. Please note that prior to meeting with Dr. Kraemer, you will need to complete a four-page intake form about your history. The intake form can be downloaded from our website here, or you can request we mail the form to you here. If you have not filled out the intake form in advance of your appointment, please plan to arrive at the office about 20 minutes before your appointment to allow time for completing the form. To maximize the time with the doctor, it's ideal that forms are complete and that organized records are received before the appointment start time. Attending your exam as prepared as possible will ensure that Dr. Kraemer will have more quality time to visit with you during your examination. Dr. Kraemer would like to personally review any previous information that you might have. Please plan to bring (or have sent to the office) any related records, x-rays or CDs of films, police or accident reports to your visit. If you have been seen by the emergency room, primary care doctor, specialists, chiropractor, physical therapist, or massage therapist prior to your visit with us, please complete our Release of Information form here for any provider(s) you previously visited for care, or consultation, and send to that provider. To note, there may be an additional form the previous provider(s) require you to complete in order to fully authorize the release of your medical records. If you need assistance getting your records, prior to the scheduled visit with Dr. Kraemer, please contact Kris at 206-266-2183. If you are not sure what medicines you are taking, bring your prescription bottles with you to your appointment. By preparing your records and yourself prior to your visit, you are helping Dr. Kraemer have a better picture of what treatments have already been tried. Dr. Kraemer requests that you have a primary doctor or nurse to care for you, order tests, and fill prescriptions as she is not able to fill that role for you. Because Dr. Kraemer provides consultations and expert opinion, it is important that you have a provider who can work with Dr. Kraemer so that you get the best care. In case of an emergency or prescription refill, we ask that you call your primary doctor or nurse. We are located in downtown Seattle. Our address is 801 Pine Street, Suite 100, Seattle 98101, though we are physically located on 8th Ave, between Pike and Pine Streets. The office is nestled at the base of the Tower at 801, a primarily residential building, notable for its towering circular shape and location - within one block of The Paramount Theater and adjacent to The Conference Center at The Convention Center. 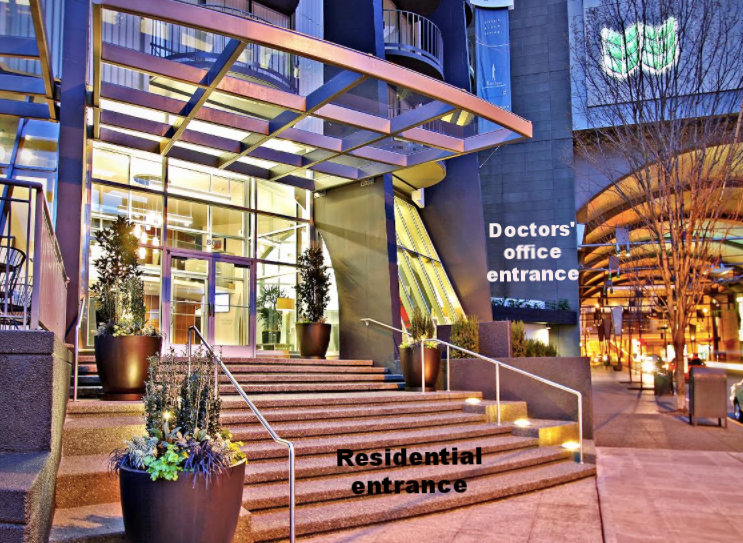 We are conveniently situated on the ground level, to the right of the main residential entrance, with the actual entrance to the doctors' office on 8th Ave and a ramp for wheelchair access. Please see below for several nearby parking recommendations and take note that we advise paying for a minimum of 2 hours, if paying in advance. Unfortunately, we do not reimburse or validate for any parking or other transportation methods. To note, several online maps default to an incorrect address east of our location in the Capitol Hill neighborhood. Dr. Kraemer is a neurosurgeon located in downtown Seattle, west of the I-5 freeway. If you accidentally find yourself in Capitol Hill on East Pine street you are nearby and only need to travel about ½ mile over the freeway (12 minutes away via walking). We are accessible by car and public transportation (Link Light Rail, Sounder, many buses, etc.). The Link Light Rail's closest stop is Westlake Tunnel Station, and several buses arrive from across the Puget Sound to within 1 to 10 blocks of the office. If you are arriving by taxi or other car service, the best drop-off location is in front of our door on 8th Ave. (heading northbound), between Pike St. and Pine St. or at the curb cut on Pine St. (heading eastbound) between 8th Ave. and 9th Ave. Allow at least 20 minutes to find the office and nearby parking, after you arrive in downtown Seattle. To note, finding the office takes time as there are several one-way streets surrounding the office and nearby construction detours that can be frustrating to navigate at times. Additionally, the office is proximal to several entrances and exits to both I-5 North and I-5 South that impact traffic patterns daily. When there are large conventions or concerts, expect traffic and expect parking to be at a premium. There is some street parking and multiple options for off-street parking detailed below. Unfortunately, parking in the Tower 801 building is only open to tenants and future residents and is not available for commercial use or guests, currently. While there is no free parking during the weekday in downtown Seattle, there are several parking options ranging between $4 - $10 per hour. If you have to pay for parking before your appointment, we recommend paying for at least 2 hours, if not longer. Street parking is available, though it can be hard to find. At $4 per hour (max 2hrs typically), this is the least expensive option and requires you pay upon parking. Pay with credit card or coins at the pay box located along sidewalk and collect sticker. Place sticker on car window as designated by pay box instructions. To find the smart phone app and pay in advance, learn more here. We recommend paying close attention to parking signs and restrictions. WSCC Main Garage - entrance on northbound 8th Ave.
Tower Building Surface Lot: enter on south corner of 7th Ave. & Stewart St.